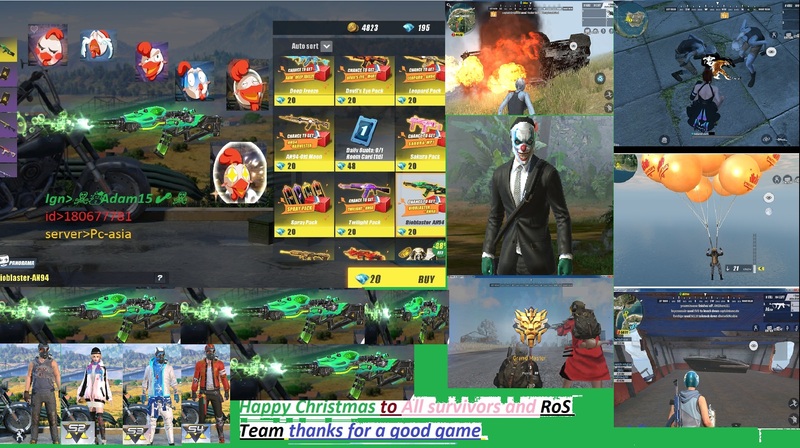 1>Dear RoSanta I open my eyes in battle royal games playing RoS its my 1st and only battle royal game I have been playing RoS for the past 10 months know..
2>Dear RoSanta I play this game everyday 7 to 9 hours both mobile and spicily in PC and I make some good friends here. 3>Dear RoSanta for the past 10 months I never use hack..
to watch and report a cheater just to bring justice to the game for others because I don't want others to fell my pain like when you are close to a win and a cheater kill you..
5>Dear RoSanta every time me and my team are close to a win and my teammates start killing each other I tell them not to do that and I am the only 1 in my team who revive my knocked teammates so we can enjoy the win together..
6> Dear RoSanta I watch all your live streams and Share them with my FB friends and I never made rough comments like other bad players made..
8>Dear RoSanta I bring so many new players in the game just to get that bank robber set and you know how hard it is to complete that set some of them still playing some left and you know reason why they left..
10>Dear RoSanta I spend my money on the game not just to get skins but to support the dev so they made this game more good and better experience for everyone..
Dear RoSanta there are more reasons then this why I love and play RULES OF SURVIVAL but I make this post short so admin can read and post my entry in contest..
At the end my wish is I want (an94 biobluster gun skin).. I have been trying for the past 4 months to get this skin via daily spicily offers but I am unlucky there hope you grant my wish.. Note. I don't have skills like others to made a good post but I have in game skills and I know all the rules to survive..
hope you will get the bioblaster skin! you put too much effort! you deserve it. I JUST WARN ALMOST ALL THOSE GUYS WHO CREATE FAKE ACCOUNTS TO SUPPORT THERE WORK I WARN THEM THAT MODES KNOW EVERYTHING WHAT IS HAPPENING IN THE FORUMS ONLY FOR JUSTICE FOR EVERYONE..